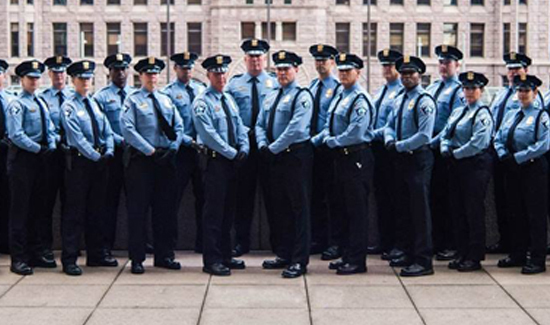 A measure that would require police officers to carry professional liability insurance could be on Minneapolis ballots in November’s general election. Members of the Committee for Professional Policing, a local police accountability group, plan to deliver about 12,000 petition signatures to the city clerk on Thursday. If enough of those signatures are verified — 6,869 are required — the group’s proposed city charter amendment will be referred to the City Council to be placed on the ballot. The “Police Insurance Amendment” would allow the city to pay the base rate for officers’ insurance coverage, but premium increases triggered by cases of officer misconduct would be covered by the officers involved in those incidents. That’s a change from current practice, under which the city is self-insured and determines if it will cover police misconduct settlements on an individual basis. The shift would give officers a direct financial incentive to stay in line, proponents say, and cut the settlements paid out by the city in cases of officer misconduct. Between 2012 and September 2015, Minneapolis spent $6.6 million on settlements. The police union’s president, meanwhile, warns that such a policy would prompt officers to interact less with the public, for fear of financial repercussions. Before putting the measure on the ballot, city officials will need to determine if it meets the requirements for a charter amendment and examine potential conflicts with state and federal laws. In Minneapolis, citizens cannot refer issues to the ballot that create city ordinances. They can, however, attempt to make amendments to the city’s charter, which outlines the broad powers provided to the city and its offices. Well, I guess the anti-police folks have finally found another method to cause law enforcement officers to stand down and “drive and wave”. If this measure passes, LEOs will be fearful of doing pro-active policing due to their insurance costs rising or their insurance being cancelled, and forcing them out of a career they have dedicated their lives to. This is insanity! I don’t think the effort is anti-cop but rather finding a way to get some police departments to change their training and policies to reduce use of force and deadly force incidents. Many communities have lost confidence in the ability of police/prosecutors to keep their houses in order. So the best way to enforce change is to affect the wallet of the those doing the job. I believe that the standard set forth in Conner v Graham was an incorrect standard that allowed those having the authority to exercise force/deadly force to define what those standards are instead of the community. This has resulted in many situations where deadly force have been exerted based upon a perceived threat instead of an actual one, situations where any risk to the officer is met with deadly force. Take the edged weapon issue. Police in England/Scotland routinely handle situations involving edged weapons without resorting to deadly force and they do that without officers being armed with guns. There is really no reason why we can’t see those types of results in our police forces. I’m actually encouraged with organizations like the PERF, recognizing that we do have an officer violence issue. In fact, senior police leadership has recently started to reach out to the British to learn how incorporate some of their techniques into our arsenal of training. Something that is sorely needed in this country.